The season for indulgence has officially begun and there’s nothing quite like a panettone to kick of festivities. These glorious cake-like breads are a holiday staple in our household and I particularly love them as a mid-morning treat with a steaming cup of coffee. This year I’m plumping for a Tipsy Tiramisu panettone from Arden and Amici. It’s a classic panettone made a little extra delicious with tiramisu cream, Amaretti, coffee and chocolate. Arden and Amici asked me to share one of my favourite leftover panettone recipes and the possibilities are endless. From bread and butter pudding, French toast, baked Alaska or quite simply a few slices with an indulgent drizzle of zabaoine. I deliberated long and hard and ultimately decided on this Tipsy Tiramisu Panettone Bombe. It’s a doddle to make, can be frozen well in advance and is gratifyingly boozy. Three essentials for any Christmas pudding if you ask me. You will need a bowl or pudding basin roughly 16cm in diameter (I used a classic Mason Cash one) and some clingfilm. Remove the ice cream from the freezer 10 minutes before you start making the bombe so that it softens slightly and is easier to work with. Line the pudding bowl with clingfilm, leaving some spare hanging around the edges as you’ll need this to fold over the top. Halve one of the panettone slices and use it to line the base of the bowl. Then use the other slices to line the sides of the bowl in a single layer, pushing them together and making sure there are no gaps. Pour over a little amaretti or marsala, letting it soak into the panettone. Liberally Scoop the ice cream into the basin, squashing it in until its full. Take the remaining halved slice of panettone and cover the top. Drizzle over some more Amaretti or Marsala (you can be as liberal or abstemious you wish). Pull over the clingfilm, making sure the top is completely covered and then push the whole thing down using the palm of you hand or a plate. Pop the whole thing in the freezer to firm up for at least 6 hours, preferably overnight. An hour or so before you’re ready to serve your bombe, remove it from the freezer and place in the fridge to soften slightly. To make the caramel sauce, place the caster sugar in a large heavy-based pan with 4 tablespoons of water. Place over a medium heat until the sugar has dissolved. Then turn the heat up and let it bubble until it turns golden and smells deliciously nutty. Remove from the heat and slowly stir in the butter and cream until completely smooth. Add the pinch of salt and then leave to cool. Remove the bombe from the fridge and then, using the clingfilm, turn it onto a plate. 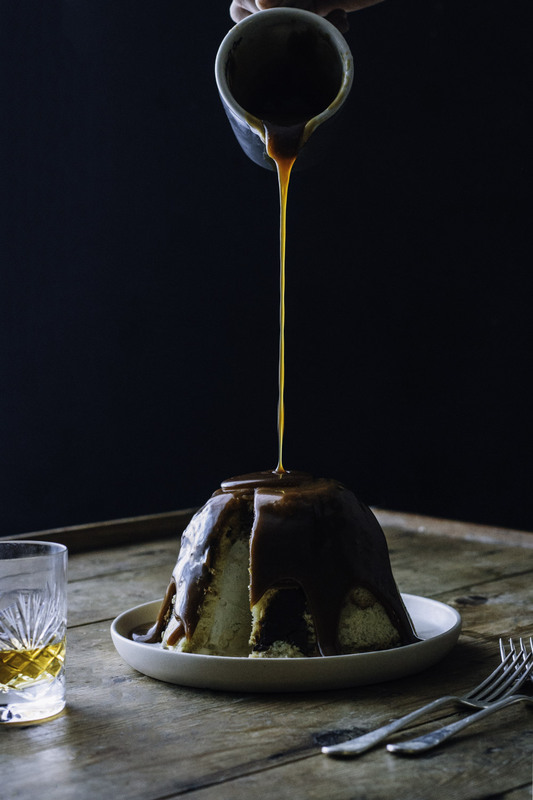 Drizzle the caramel sauce generously over the Tipsy Tirimasu Panettone Bombe and serve straight away. And there you have it. 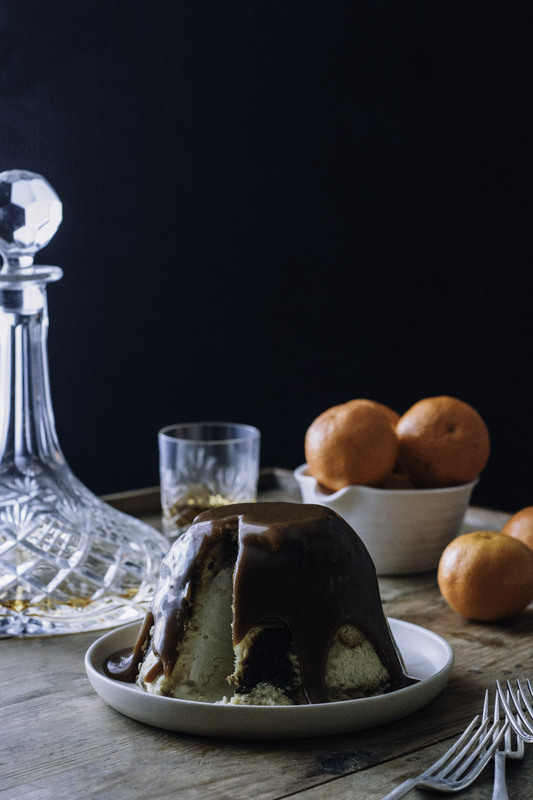 Minimal effort for a crowd-pleasing pudding fit for any festive feast.